"Whenever I take up a newspaper and read it, I fancy I see ghosts creeping between the lines. There must be ghosts all over the world. They must be as countless as the grains of the sands, it seems to me. And we are so miserably afraid of the light, all of us." From this distance, and after the passing of years, I find myself communing with Kurt Sonnenfeld, my wraith-like companion, a fugitive from justice to some, a vilified victim to others. As I write, it is winter in London and, walking under rows of skeletal trees, the words of Thomas Lovell Beddoes, the 19th century English poet, come to mind: “For winter is the season of the tomb, and that’s my country now”. But, notwithstanding the desolation of the scene before me, I am heartened by the fact that my return to the Argentine summer is only weeks away. And once again in Buenos Aires, on humid evenings, I and my friends will surely discuss, as we never weary of doing, the dramatic events that befell Kurt Sonnenfeld. Raising our replenished glasses, and donning our sweaters to ward off the encroaching chill, we will be at one in our conviction that Kurt, his presence stamped indelibly on our collective consciousness, is unlikely to join us again in our wine-fuelled fraternity. It has been almost a decade since I had any direct contact with Kurt, and the respective landscapes of our lives have altered irrevocably. It is my viewing of the recently produced video “Kurt Sonnenfeld: The Man Behind the Camera” that has led me to reflect anew on the abiding mystery of our association, the better to unravel its tangled skein. In this short yet thought-provoking documentary, and from the vantage point of his life in Argentina, Kurt continues to plead his innocence, adamant that there are no reasonable grounds for the charge levelled at him by the office of Colorado’s District Attorney: that he is guilty of the first-degree murder of his first wife, Nancy Sonnenfeld, whom he had married, after a whirlwind romance, on a beach in California's Big Sur in 1993. As I read about her, Nancy, once a glamorous and high-powered advertising executive and animal lover, leaps from the page as a young woman who was not only resourceful but intrepid, addicted to roller-coasters and swimming in Louisiana’s snake-infested lakes. It is also telling that Nancy’s mother, Eleanor Campbell, has testified to the fact that, at the tender age of 19, Nancy had the presence of mind to continue serving customers at a New Orleans bank as two masked gunmen ordered all inside to hit the floor. In any case, it would appear that the marriage between Nancy and Kurt had become irretrievably brittle, and any hope of a last-ditch reconciliation dashed by the rancorous fallout from a 2001 Thanksgiving trip to Thailand. Sifting the evidence, Detective Kenneth Gurule has alleged that, in the course of this fateful holiday, Nancy discovered that Kurt was buying and using heroine, giving rise to a visceral marital altercation, and to both of them making their own way back to the USA. On home turf in Colorado, on November 27th 2001, Nancy announced to Kurt that she had resolved to file for legal separation. However, in a final effort to shore up their foundering marriage, Nancy and Kurt agreed to spend New Year together. Kurt maintains that at 1am, and while checking his e-mails, he was shaken by the sound of a single gunshot. At 1.40 am, law enforcement officers arrived at the Congress Park villa--the frontage embellished with a brass plate bearing the inscription "On this site in 1897 nothing happened"-- to find Nancy alone in the bedroom, sitting on the chaise longue, and with a bullet wound behind her right ear. Breathing heavily, she was to die six hours later, at the age of 36. Intent on conjuring up such a frantic scene, I imagine that, as he was being led away on suspicion of Nancy’s murder, Kurt must have felt “all alone on the spinning wheel”, as had Teddy, the character that he had brought to life so vividly in his short story “Fire Red Factory”, published many years before in Colorado University’s student magazine. The trial date was set for June 15th, 2002, but providence was to smile on Kurt. One day before the proceedings were due to begin, Michelle Ann Amico, Denver’s Deputy District Attorney, dismissed the charges. Amico had reached her decision after the discovery of an apparent suicide note, seemingly written by Nancy, with the words “What is more beautiful than love and death?” The word “love” had been crossed out. By February 2003, and keen to put distance between himself and recent events, Kurt had taken up the invitation extended by a friend’s uncle and made his way to the Argentine seaside resort of San Bernardo. It was there that he was to meet Paula Duran, his second wife, marrying her in April 2004. It is ironic that Kurt who, according to his friend Mark Seewald loved “to be in the middle of things", had been thrust by fate to the coastal fringe of the world’s most southerly nation. Seeking for clues that continue to elude me, and re-reading “Fire Red Factory”, it strikes me that the words “across hundreds of miles of brown gravel ocean”, penned by that promising student, distil the pathos of a youthful premonition. When in October 1995, after four years in Madrid, I arrived for the first time on Argentine soil, guided there by instinct to put down a new life, I encountered a country flush with prosperity. President Menem had pegged the peso to the dollar and the economy was booming. Still proud of the fact that, as recently as the 1920’s Argentina had been the world’s 7th richest nation, the inhabitants of Buenos Aires could once again stake a claim to their city being the Paris of Latin America. But the bubble was soon to burst, and in December 2001 unpopular banking restrictions were imposed. Had he been alive to witness it, Domingo Sarmiento, the apostle of civilization and a former president of the nation, would surely have been appalled by the spectacle of disaffected citizens running riot through the capital, making barbarism, his worst fear, a living reality. Despite its woeful consequences at the national level, from a personal perspective the crisis spelt opportunity, as it led to my obtaining a position with an international organization committed to averting economic disaster for Argentina. Now earning dollars in a pesified economy, I was in the position to rent a flat in the elegant Palermo neighbourhood, and it was there that I met José, a neurologist who threw lavish parties in his spacious apartment. It was not long before I was invited to these soirées, and it was within this rarefied circle that, in July 2003, I was to meet an American man in his early thirties. Engaged in intent conversation with another group, I was distracted by a figure standing alone on the balcony, smoking a cigarette abstractedly, and exuding an air of profound diffidence. Edging up to engage me in conversation, it did not take me long to realize that this was an individual who was well-informed and articulate. But there was also a careworn aspect about my new acquaintance, a trait that I came to understand after he informed me that a legal case back in the States continued to prey on him. Preparing to leave, he suggested that, as he and his wife were living in Callao Avenue, just a few blocks from Recoleta Cemetery, I should call round to see him one evening. My curiosity whetted, I left the party with no doubt that, as soon as the opportunity presented itself, I would phone Kurt Sonnenfeld to take him up on his offer. Over the next year, my visits to see Kurt became a weekly fixture. Sitting in the descending dusk, and sharing one bottle after another of Argentine Malbec, Kurt and I were drawn to the realization that our initial meeting had been no chance encounter. As Kurt had lost Nancy, while still a student at Cambridge University, my boyfriend’s body, testifying to a violent, self-inflicted death, had been found at the age of 21. I asked Kurt if, reviewing the contours of his own story, he could empathize with my occasional bouts of self-recrimination: that, by having failed to prevent my partner’s suicide, I had been a murderer by default. There were moments when the evenings that we shared became harrowing when Kurt, who had worked as a videographer at Ground Zero, admitted the devastating effect that the event had had on him, feeling compelled to show me images of grim discoveries under the rubble. Troubled by the scattered body parts, and gasping for air and space, I would suggest that, as it was the height of summer, we should sit on the balcony. Once there, I did my utmost to dispel Kurt’s gloom by steering the conversation in another direction, mooting Kurt’s expressed desire to move to the city of Mar del Plata, so as to be near the sea again, and congratulating him on a recently acquired job in which he was to play a detective for a television commercial to be shown in the USA. It was invariably late as, the wine working its way through my system, I would say “goodnight” and head for the safe house of my flat. I asked myself what Beddoes had been like, this ill-starred poet whom Ezra Pound had termed the “Prince of Morticians”, expelled from the German University of Göttingen on account of his riotous behaviour, and who had attempted in vain to discover physical evidence of a spirit that survived the death of the body. 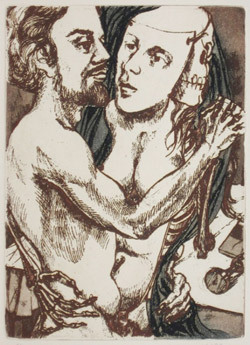 After the end of his relationship with Konrad Degen, towards whom he harboured homosexual feelings, he had, after apparent contamination by a diseased cadaver in Frankfurt, attempted suicide by opening an artery in his leg, resulting in amputation, before killing himself by taking poison. In his suicide note he signed off wistfully that he was “food for what I’m good for—worms”. Quickening my step, words that my now deceased boyfriend had addressed to me as our relationship disintegrated, utterances initially with their own internal logic, but later disjointed and finally indecipherable as he hurtled over the precipice of madness, came back to haunt me. I could not escape from the disconcerting truth that his had been a chant resonant enough to propel me, in a bid to silence its cadences, to a far-flung continent. And now, the echo, coaxing and rebuking by turns, formed a counterpoint to the incantation of allegations invoked by my College, stray fragments of Beddoes, and the recent words of loss that Kurt had expressed about Nancy, blending into an unholy chorus that assailed me from every corner. In a state of shock, José phoned on August 31st 2004 to inform me that Kurt had been arrested. Unknown to us, Interpol had been looking for Kurt in Buenos Aires since December 2003, when Bill Ritter, Denver’s District Attorney, confident that there was now sufficient evidence to get a conviction, had filed an international arrest warrant. Ritter contended that new evidence had come to light: DNA and blood tests pointed to culpability; the alibi that Kurt had provided to the police could now be shown to be palpably false; two of Kurt’s former cell-mates, Robert Dryer and Damian Whitehead, had confessed that Kurt had confided to them that he had, after all, killed Nancy. As the taxi made its tortuous way across the urban sprawl to Devoto Prison, where Kurt was now interned, I was forced by recent events to ask myself whether, in the early hours of January 1st 2002, Kurt had not, like Teddy in “Red Fire Factory”, been “bloody fisted and bloody faced”. Had I, in my zeal to seek out a kindred spirit in this distant hemisphere, not been duped? Arriving at the ramshackle prison, a far cry from his well-appointed apartment, I waited for Kurt to be brought in. Overcoming his initial surprise at my visit, Kurt said, “You see, I was right when I said that they could reopen the case at any moment.” I assured him that, in order to enlist support for his plight, I would write the story of our friendship. Kurt looked thoughtful, but did not reply. Later, it came as a surprise to my circle of friends when, after eight months of captivity, Kurt was set free. It transpired that Judge Daniel Rafecas, concerned that Kurt could face the death penalty if returned to Colorado, had turned down the extradition request. When, after his release, I attempted to re-establish contact with Kurt, my telephone messages and e-mails went unanswered. On my way home, walking down the broad expanse of Callao Avenue, I would pause outside the building where he had lived, looking up at the empty balcony. It was not long before I decided to take another way back. In the video “Kurt Sonnenfeld: The Man Behind the Camera”, in raising the spectre of Nancy’s death, Kurt continues to refute the charge of first-degree murder pressed against him. Fanning the flames of conspiracy theories, he maintains that he is in possession of video footage, amassed in the course of his work as a Ground Zero videographer, and which would prove that the United States government not only had prior knowledge of the attack, but collaborated in the carnage wreaked on the Twin Towers. And, furthermore, Kurt asserts that, in a devious attempt to silence his claims and seize the supposed evidence, U.S. authorities have trumped up charges against him. Now happily married, and with twin daughters, Natasha and Scarlett, Kurt makes it clear that, while missing his parents and siblings in the USA, he would not return to live there, even if he could. Meanwhile in Argentina, he has authored his own apologia, the book El Perseguido, and has garnered the support of allies such as Adolfo Pérez Esquivel, recipient of the 1980 Nobel Peace Prize. But with an adversary as formidable as the USA, even if the intricacies of the extradition process are exhausted, it would not seem too far-fetched to conjecture that Kurt's fate could still come to be sealed by a shadowy trade-off. It has been a long winter in London. Casting my gaze on the bedraggled shrubbery outside the window, I think of the plane touching down in the Argentine summer, and the prospect of a happier season. It is too early to know whether Kurt and I will end our days on the “ragged sides” of Argentina. But I very much like to think that the “murderers and idiot men”, evoked by a 19th century Gothic poet, are words that belong firmly within the confines of that author’s imagination.